Your smart home needs a brain, so get started with a SmartThings Hub. The Samsung SmartThings Hub works with a wide range of smart devices and allows you to control them from the free SmartThings App, Google Assistant, or Alexa. Receive notifications or alerts about what's happening in and around your home and remotely control your home's security, energy usage, and lighting. You can add as many additional SmartThings sensors or other popular Z-Wave, ZigBee, or Internet-connected products to enhance your connected home. Works with smart devices from the following brands: Philips Hue, Ring, Arlo, Eco bee, Honeywell, Bose and more. (Not compatible with NEST, Sons, D-Link, and Blink devices.) 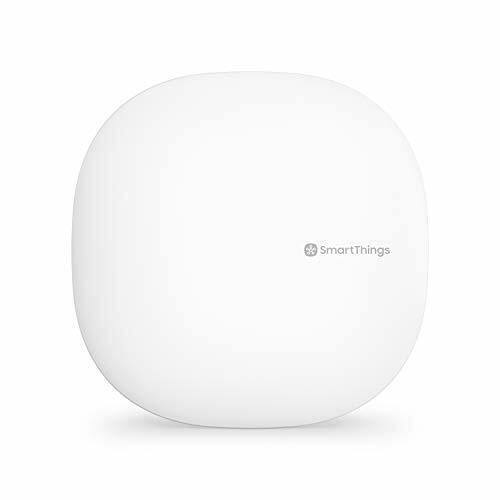 Look for the “Works with SmartThings” logo next time you’re buying a connected device for your home, or visit SmartThings website to see the full list of compatible devices. Requires an internet-connected Wi-Fi router plus the free SmartThings app for Android (6.0 or later) or iOS (11.0 or later). Connected devices sold separately. Only works in the US. Includes: Ethernet cable and power supply, quick-start guide, and health and safety guide. 1 year Samsung SmartThings limited warranty. Technical Details: Power: In-wall power adapter Communication Protocol: ZigBee, Z-Wave, and Wi-Fi Range: 50-130 feet depending on your home’s construction Operating Temperature: 32-104°F Product not supported outside U.S.quick-start guide, and health and safety guide. 1 year Samsung SmartThings limited warranty.